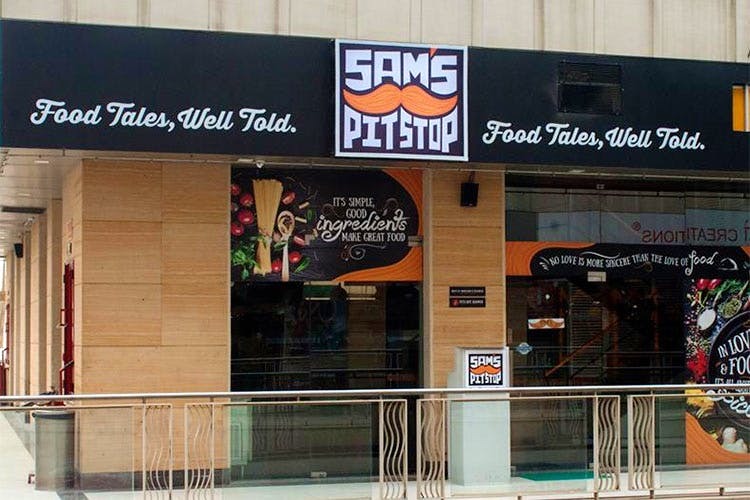 As fans of all-day brekkies, we’re happy because Sam’s Pitstop serves breakfast till 5pm. Enjoy the warm, wood-panelled, diner style café, and the loads of space for privacy and large groups. Skip the Mediterranean and go straight for the Italian and Continental. You can overload on breakfast with waffles, Eggs Benedict and coffee, or better still, go for the massive English Breakfast. Looking for mains? The Char Grilled Lamb Burger is as good as they come, and we quite liked the Mushroom Risotto and the Pan Seared Basa as well. They have soups and starters too, with a smattering of Mediterranean to take the edge of all the Italian pasta and pizza selections. If you’re in the mood for something a tad unusual, then it’s got to be the Fish Burger or Black Beard Chicken, a hot, peppery, chicken steak, grilled and served with all the usual sides, mash and veggies. Portions are medium to large depending upon the cuisine, and they tend to skimp on the starters, but the Italian mains make up for it. Go with an appetite though, the menu is massive.